Have a Sierra Electric low voltage lighting system installed in your older home from the 1950's and 1960's? Find replacement Sierra low voltage light switches, remote control relays, and wall switch plates that are compatible with your wiring. (Note: Sierra Electric of Gardena, CA went out of business decades ago.) 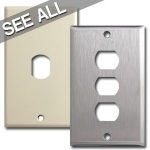 Our Despard line of switches and wallplates are fully compatible with your system. 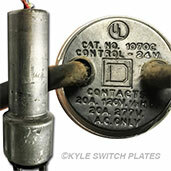 GE remote control relays may be used to replace any broken or missing solenoids in your system, if your switches have 3 wires coming out of the back. For products & prices, click a category. 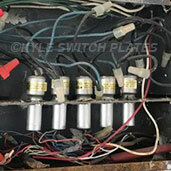 Find low voltage trigger switches, relays, wall switch plates, etc. 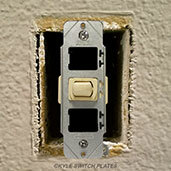 Sierra Electric brand low voltage light switches, switchplates, and relays originally became popular in mid-century homes built between 1940 and 1980 but have, for the most part, been discontinued. Sierra low voltage trigger switches (sometimes referred to as thumb switches because of their shape) are currently manufactured by Pass and Seymour Legrand (1091 switches) and are compatible with Despard interchangeable style switch plates and mounting brackets (also called straps). Mounting straps for 1091 switches are necessary for holding the switch and attaching the cover plate. The versatile strap shown here can hold 1 switch (as shown, in middle), 2 switches (in the top/bottom positions), or 3 switches. 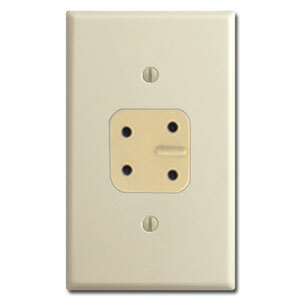 These momentary low volt switches (rated 3 amps at 24 volts AC-DC) were made for use with copper wiring only and feature three quick connect terminals on the back for simple installation. The left side of this cover has a despard switch in the middle position, with blank filler dummy switches above and below. Older, discontinued 3-wire Sierra relays may have the part number 1070A, 1070C or 7048S and be marked with the old Square D logo. 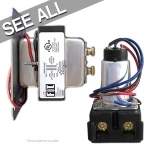 To replace one of these, you'll need the Pass & Seymour 1070B Mechanical Latching Relay. 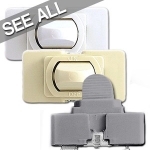 If you're looking for replacement outlet covers for old style Sierra outlets, we carry them in ivory. We do not carry the old style outlets. 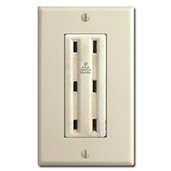 Sierra also made this style of triple outlet, which is no longer available for sale. 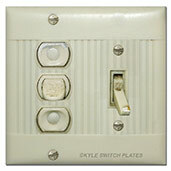 You can buy a replacement sierra triplex outlet cover here. 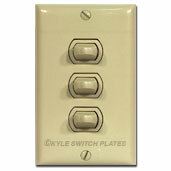 You can use GE low voltage switches to replace old despard style low voltage switches in your Sierra system. Make sure your old switches have 3 wires coming from them before ordering replacement GE brand switches (which also have three wires). Another option for upgrading the look of your Sierra system switches is to get Touch Plate. 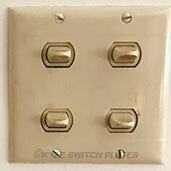 But, EVERY Sierra light switch needs to be replaced with TWO Touch Plate buttons (one to act as an "on" switch, the other as "off"). 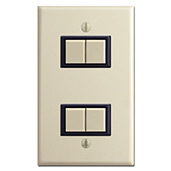 For example, a cover plate with 2 Sierra low voltage switches can be swapped out & replaced with a 4-button Touch Plate unit (4 buttons in a 1-gang cover plate). 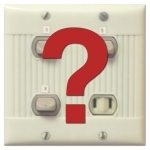 There are many options for replacing Sierra switches. 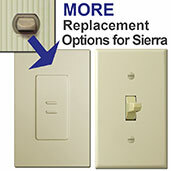 See our complete guide to replacement switches for a Sierra low voltage system.